On this page you will find resources, tools and lesson plans showing how academic institutions are using Biolog technology to perform classroom based learning. If you are currently developing or teaching a course in Microbiology, you can use the lesson plans provided to enhance your course offerings in introductory Microbiology and Microbial Ecology. Leading educational institutions around the world use Biolog’s technology as a teaching tool because it helps in demonstrating and explaining the fundamental tenets of Microbiology using modern technology that is widely adopted in university as well as industrial Microbiology Laboratories. Classical Microbiology describes bacterial strains and distinguishes bacterial species based on their phenotypic traits. Biolog offers the most advanced phenotypic testing system in the world and presents this basic concept in an easy to understand and easy to use format. For example, Biolog’s revolutionary GEN III MicroPlate can be used to characterize and identify both Gram-negative and Gram-positive bacteria from more than 1,300 species. The MicroPlate contains 96 tests which profile and differentiate strains based on metabolism of chemicals and resistance to toxic chemicals. Biolog technology teaches the student that bacteria (and other microorganisms) have different properties which give each some unique advantage to survive and thrive in the biosphere. Bacteria need chemicals that they can consume as a source of food, and they also need to be resistant to a wide range of potentially toxic chemicals in their environment. 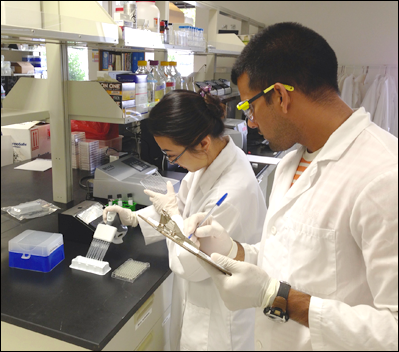 A typical laboratory exercise would be to have students isolate a bacterium from their environment (or the Professor can provide an unknown) and then test it in the GEN III MicroPlate to characterize and identify it. This can open discussions about the chemical composition of the environment and the role of bacteria in recycling chemicals. In advanced classes it can be integrated into a discussion of biochemical pathways in cells. Some bacteria may not be identified as there remain many undescribed species. In advanced teaching laboratories, the student could go on to do further testing and perhaps even describe new species, as has been done by Professor Jeff Newman at Lycoming College [1, 2]. Biolog data is commonly used to phenotypically describe new species in the International Journal of Systematic and Evolutionary Microbiology. Biolog technology can also be used in demonstrating and teaching concepts of Microbial Ecology. In nature, bacteria exist in complex communities. Just as Biolog MicroPlates can be used to characterize pure cultures of bacteria, they can also be used to characterize mixed ecological samples, from soil, from aquatic environments, and even from human skin. The EcoPlate and the GEN III MicroPlate are ideal for these types of studies. A typical laboratory exercise would be to have students collect and analyze samples from different environments, or from the same environment over time (to see if it is stable or changing). This can open discussions of the environment, the role of bacteria in the biosphere and in chemical recycling, competition among microorganisms, and ecosystem sensitivity or resilience. The Biolog MicroStation is an ideal instrument to acquire for a teaching laboratory. It reads the GEN III MicroPlates and automatically matches the patterns to Biolog’s extensive species library, thereby demonstrating the concept of pattern matching. The instrument is a general, versatile and robust microplate reader. As such it can be used for any type of colorimetric assay, for example in teaching biochemistry (chemical analytical assays) or immunology (ELISA assays).